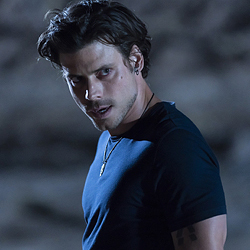 The first set of episode stills from the season premiere of Midnight, Texas is out, and Manfred’s looking so good. Some more casting details have also been announced. UNIVERSAL CITY, Calif. – Oct. 5, 2018 – “Midnight, Texas,” NBC’s popular supernatural drama series, has added an array of guest stars as it begins its second season on Friday, Oct. 26 at 9 p.m. ET/PT. Based on the best-selling book series by Charlaine Harris (author of the novels that inspired “True Blood”), “Midnight, Texas” takes a journey into a remote Texas town where nothing is what it seems. In Midnight, Texas, being normal is strange and only outsiders fit in. It’s a mysterious safe haven for those who are different – a perfect place for anyone looking to hide from the outside world. As the town members’ bond is stronger than ever, the mysterious arrival of new hotel owners threatens the balance of Midnight. Michael Harney (“Orange Is the New Black”) as Philip Charity – Olivia’s estranged father, who seems like the perfect all-American dad, but is actually bitterly estranged from Olivia, whom he abandoned when she was just 9 years old. Mindy Sterling (“The Goldbergs”) as Kiva Goldwater – With a smoker’s voice and a bedazzled eye patch covering her missing eye, she is a gypsy shaman, an expert when it comes to curses. She’s willing to work with Manfred, but on her terms. Adam Langdon (“Moe & Jerryweather”) as Basil – An affable, geeky pizza delivery boy with a deep appreciation for the Rubik’s cube… and a dark secret. Jasmine Cephas Jones (“Hamilton,” “Girls”) as Addie – A devotee and member of the Delilahs who stands out among her peers. When her snooty “country club” brother and sister witches turn their backs on our heroes, Addie comes to the rescue. She delves into black magic to help save Midnight, Texas from its enemies. Nick Lee (“Reign”) as Theophilus – One of the Original Witches and founders of Black Magic.